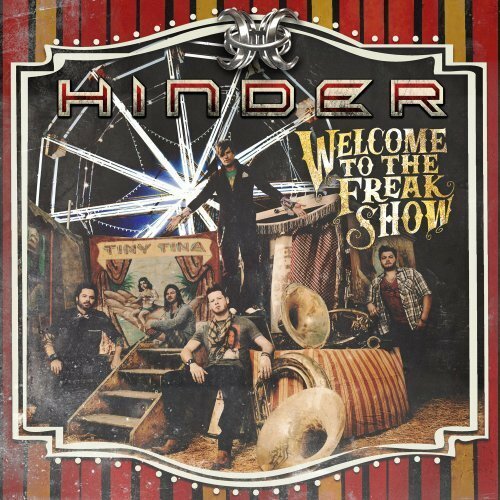 Things have been kind of quiet on the Hinder front for much of 2012. They reconvened early in the year following their 2011 All American Nightmare tour and started the writing process for their next release. The writing took the band to new areas unexplored as they wrote about life experiences they have encountered as opposed to just writing about a theme or particular subject like they had in the past. The album was almost two years in the making but it seems the wait was worth it. After a lengthy recess the Oklahoma band have finally released Welcome To The Freakshow their fourth and most mature album to date. The title cut is eerily similar in sound to their prior title cut from 2010s All American Nightmare but that is where the similarities end. This time around the band decided to keep the producing in house somewhat as both drummer Cody Hanson and Marshall Dutton were in charge of controlling the knobs. The album has a variety of musical variation as you can hear several of the bands influences throughout. The quick spirited “Save Me”, the first single, kicks off the album as it clocks in just under three minutes. The raunchy and tantalizing “Ladies Come First” begins with a hypnotic riff that will stick with you like peanut butter to ribs. Things begin to slow down a tad with “Should’ve Known Better”, one of the top candidates for best track on the disc. The band has delivered a good mix of songs ranging from the pop stylings of “Get Me Away From You” to radio ready songs such as “I Don’t Wanna Believe” and the southern tinged “Anyone But You”. These days it is a little surprising that a band can boast the same lineup for four albums without any personnel change much less a ten year period. Singer Austin Winkler, drummer Cody Hanson, bassist Mike Rodden, guitarists Joe “Blower” Garvey and Mark King all get along well and that is a big part in maintaining longevity. In a recent interview Winkler said “I want Hinder to be remembered as a band that wrote great songs that people can relate to”. After listening to Welcome To The Freakshow I believe the people will relate and enjoy.